Following the season-opening rounds at the long distance classics of Daytona and Sebring in Florida, the IMSA SportsCar Championship now heads to California. Coming up on April 14 is the 100-minute event at Long Beach, the shortest race of the year. On the 3.167-kilometre street circuit, the Porsche GT Team fields two Porsche 911 RSR racers against three other automobile manufacturers in the strongly represented GTLM class. In addition to these fascinating sports cars, fans can look forward to a real highlight of the season at Long Beach, where another very popular US series, IndyCar, also contests a championship round on the same weekend. 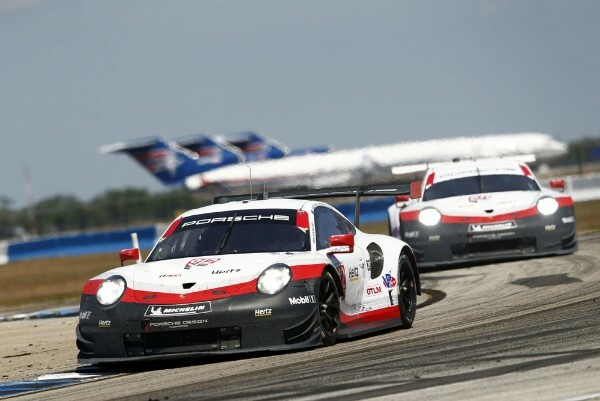 After winning the Sebring 12-hour race, Porsche has moved into second place in the manufacturers’, drivers’ and team classifications of the IMSA SportsCar Championship. Porsche also ranks second in the prestigious North American Endurance Cup. The long-distance races at Daytona, Sebring, Watkins Glen and Petit Le Mans count towards the toughest category in terms of performance and reliability in GT racing worldwide. During construction of the street circuit around the port area of Long Beach, more than five kilometres of fencing was erected and 1,400 concrete blocks were laid. The race with the picture-postcard backdrop of sun, sea and palms is regarded as the American equivalent to the Monaco Grand Prix. In fact, the street course hosted the Formula 1 United States Grand Prix West from 1976 to 1983. And like in the Principality on the Cote d’Azur, there is no lack of stars and starlets. No wonder – the Hollywood dream factory is just around the corner. In the cockpit of the #911 Porsche 911 RSR, Patrick Pilet (France) and Nick Tandy (Great Britain) contest the GTLM class. These two won the Long Beach race in 2016 and recently clinched the first win of this season in Sebring with the 911 RSR. Laurens Vanthoor (Belgium) and Earl Bamber (New Zealand) share driving duties in the second 911 RSR (#912) fielded by the Porsche GT Team. The GTD class, in which Porsche customer teams campaign the 911 GT3 R, is not contested at Long Beach. In addition to the optimised setup of the 911 RSR, the reliability has been further improved for its second racing season. Depending on the size of the restrictor, the motor, which is positioned in front of the rear axle, puts out around 375 kW (510 hp). The large rear diffuser combined with a top-mounted rear wing provides strong downforce and aerodynamic efficiency. The race takes off on Saturday, 14 April, at 13.05 hrs local time (22.05 hrs CEST) and can be viewed live outside the USA on http://www.imsa.com. The IMSA SportsCar Championship, a sports car race series contested in the USA and Canada, was run in 2014 for the first time. The series was formed from the merger of the American Le Mans Series and the Grand-Am Series. Sports prototypes and sports cars start in three different classes: GTLM (GT Le Mans), GTD (GT Daytona) and P (Prototype). The Porsche 911 RSR runs in the GTLM class, with the Porsche 911 GT3 R contesting the GTD class. Only the GTLM and P classes will be contested at Long Beach.